Communist Parties all over the world have been exposing the imperialist interests behind The Trans-Pacific Partnership (TPP) and Transatlantic Trade and Investment Partnership (TTIP). The Trans Pasific Partnership (TPP), an agreement encompassing twelve Pacific Rim countries (Brunei, Chile, New Zealand, Singapore, Australia, Canada, Japan, Malaysia, Mexico, Peru, the United States, and Vietnam) and representing more than 40 percent of global GDP, has been agreed upon on October 5th this year. The negotiations of TPP had been kept secret until some chapters of it were leaked through Wikileaks in 2013. In an article by Cira Rodriguez Cesar in Prensa Latina, it is underlined that by this partnership a trade area which will reduce the obstacles in the economic flows by releasing more than 18 thousand taxes with which various countries taxed American products will be formed. This may also mean reshaping the industries and influence the price of food. Information based on the document which had been leaked show that TPP favours the large transnational corporations, targets the commercialization of the sectors like health, education or the environment. One of the main concerns about TPP is the broad freedom it assures for the transnational capital including juristical incentives before the courts organized under the World Bank or the United Nations. 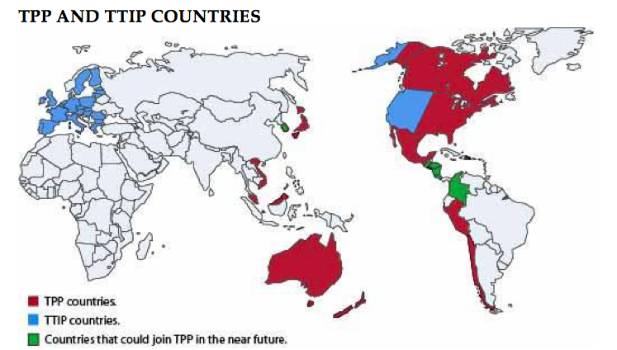 TPP could be considered as the greatest trade treaty of the world in the past 20 years. Similar to TPP, Transatlantic Trade and Investment Partnership (TTIP) is a series of free trade negotiations, carried out mostly in secret between the U.S. and the E.U. TTIP's draft had been leaked in 2014. After the incident, the European Commission revealed a limited set of clauses and then in January 2015 published parts of an overview. TTIP will form a free trade area amounting to potentially the largest regional free-trade agreement in history, covering 46% of world GDP.